Valentines Day Celebration! BMW Book Number 2 Giveaway! 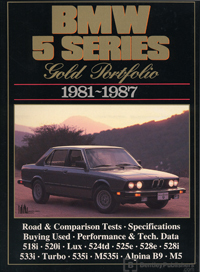 We have one copy of the BMW 5 Series Gold Portfolio: 1981-1987. This BMW 5 Series Gold Portfolio: 1981-1987 is a collection of 50 original articles compiled from the pages of Autocar, Autosport, Cars & Car Conversions, Competition Car, Fast Lane, Modern Motor, Motor, Motor Manual, Motor Trend, Road & Track Sports Car Graphic, and Wheels. The information collected in these reprinted articles includes 20 road and track tests, plus specifications, touring and long-term reports. Please note that due to different international contest laws we must limit eligible prize winners to US residents. You must be a legal resident of the 50 United States or the District of Columbia over the age of 18 with access to the Internet and a valid email account to enter this giveaway. Good luck!! To enter: To participate in the Sweepstakes, visit 5 Series.net and accurately post a comment in the Sweepstakes thread (This Thread). Only one (1) post will be accepted per member on this thread; all others will be removed. Limit one (1) entry per person or email address. Multiple entrants are not permitted to share the same email account. Use of any automated system to participate is prohibited and will result in disqualification. In the event of a dispute as to any registration, the authorized account holder will be deemed to be the participant. The "authorized account holder" is the natural person assigned an email account. The potential winner may be required to show proof of being the authorized account holder. Sweepstakes Period: Unless specified otherwise, the Sweepstakes entry period begins Februay 7, 2015 when the Sweepstakes is posted on 5 Series.net and ends at 4 p.m. (Pacific time) on February 14, 2016 (the “Sweepstakes Period”). One (1) winner will be selected from entries properly submitted and timely received during the Sweepstakes Period. Selection of Sweepstakes Winners/Odds: There will be one (1) winner for a copy of the book BMW 5 Series Gold Portfolio: 1981-1987. The winner will be selected at random from the members who accurately complete a post on the Sweepstakes thread during the Sweepstakes Period. The winner will be notified via PM and announced through a post on the 5 Series.net Sweepstakes thread after 6:00 PM (Pacific time) no later than than February 15th, 2016 . In the event that a winner is disqualified for any reason, Sponsor may, at its sole discretion, award the applicable prize to an alternate winner(s). Any return of prize notification as undeliverable will result in a forfeiture of any prize and an alternate winner(s) may, at Sponsor's discretion, be selected. Decisions of the Sponsor on all matters relating to the Sweepstakes are final. Sponsor reserves the right not to award all prizes in the event that an insufficient number of eligible entries are submitted, as determined by the Sponsor, at their sole discretion. Odds of winning will depend on the number of eligible entries received during the Sweepstakes Period. I've got an e24 and always enjoyed the e28. Great idea for my son's future car! Four months old now, gotta start early! The contest is now closed. The winner will be announced on Monday February 15. Valentines Day Celebration! BMW Book Number 1 Giveaway! Winners of the 5 Series Books Announced! Quick Reply: Valentines Day Celebration! BMW Book Number 2 Giveaway!